You’re looking for a cover for your truck camper, and you’ve taken the correct first step by finding RV Covers Direct® online. 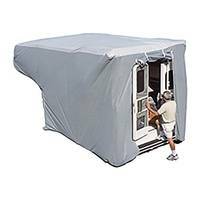 We stock truck camper covers by ADCO, the oldest protective cover company in America. Each of our truck camper covers comes standard with a 2 year warranty. ADCO has taken care to include all of the features you need, including vinyl reinforced front corners, front and rear cinching system, and attached nylon straps and buckles. Not only do you get a great looking cover, you get a cover that functions as you expect to protect your truck camper from dust and debris. Order today before 3 pm eastern time, and we’ll ship your cover today.